A well defined chin helps give balance to the face and creates a major part of one’s profile. When people look in the mirror, most focus on the size and shape of their noses, their ears, sagging jowls, or fine wrinkling of the skin. But even though few examine their chins with the same discerning eye, having a “weak chin” is certainly not an asset. 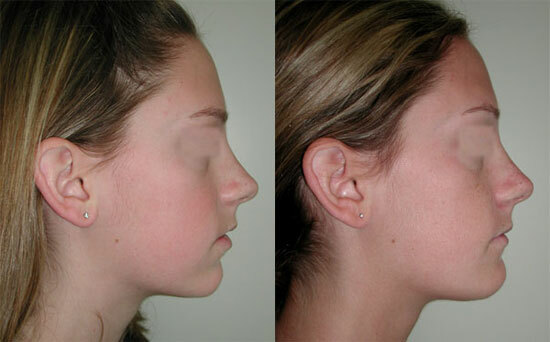 It is common for Dr. Newman to recommend chin surgery in addition to nose surgery when he sees that chin augmentation is necessary to achieve facial balance and harmony. Fortunately, this is a relatively straightforward procedure that can make a major difference and can be shown to patients with Computer Imaging available in our office. Another possibility for improvement through chin surgery is submental liposuction in which excess fatty tissue is removed to redefine the chin or neckline. When there is a contributing problem of dental malocclusions or birth defects in the structure of the jaw itself, surgery of the jaw can improve the form and function of the lower face and greatly enhance appearance. Your consultation can help you decide on the type of surgery that addresses your concerns. To augment the chin, Dr. Newman begins by making an incision either in the natural crease line just under the chin or inside the mouth, where gum and lower lip meet. By gently stretching this tissue, he creates a space where an implant can be inserted. This implant, made of synthetic material that feels much like natural tissue normally found in the chin, is available in a wide variety of sizes and shapes. This allows custom fitting of the implant to the configurations of the patient’s face. After implantation, Dr. Newman uses fine sutures to close the incision. When the incision is inside the mouth, no scarring is visible. If the incision is under the chin, the scar is usually imperceptible. In chin reduction surgery, incisions are made either in the mouth or under the chin. Dr. Newman sculpts the bone to a more pleasing size. Immediately after surgery, Dr. Newman usually applies a dressing that will remain in place for two to three days. You will experience some tenderness. Post-operative discomfort can be controlled with prescribed medications. Chewing will probably be limited immediately after chin surgery, and a liquid and soft food diet may be required for a few days after surgery. Most patients feel a stretched, tight sensation after the surgery, but this usually subsides in a week.